This post is based on one I wrote for Mississippi Atheists in March. It has been revised and expanded. 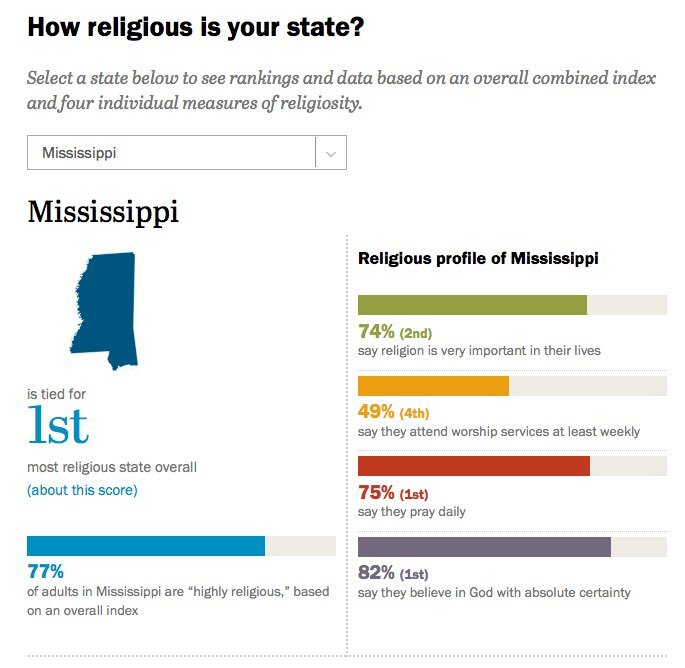 I doubt that this is going to surprise anybody, but I could not resist running the state of Mississippi through the Pew Research Center's "How religious is your state?" index based on data collected during their Religious Landscape Study. Mississippi tied with Alabama for first place. So yeah, Mississippi is a religious state. It appears that 82% of Mississippians indicate that they believe in some sort of god "with absolute certainty." I suppose the silver lining is that it is only 82% believe this. This number seems certain to decline in the future, although I suppose the state of public education in Mississippi might be an obstacle. Of the various statistics, I think the one that surprises me the most is that we lead all states with 75% of Mississippians claiming that they pray daily. This number seems high even for many of the Southern Baptists I know. I suspect it is inflated due to social desirability. They know they are supposed to pray every day, and so many say they do. I suspect the reality is something less than 75%. I know, I know. What the hell am I still doing here? There really are a number of things I like about Mississippi, even though the excessive religiosity and widespread political conservatism certainly aren't among them. One of these days, I'll have to write a post about some of the positives about this state.